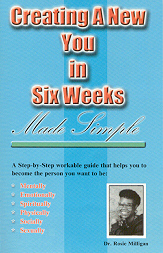 In "Creating A New You In Six Weeks Made Simple," Dr. Milligan guides the reader through a series of journal exercises that will enhance your physical and sexual well-being, your financial status, your family relationships, your career, and both your mental and spiritual outlook. A new you is possible-and simple-in just six week! You can do it with ease.